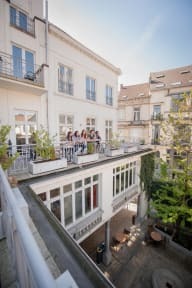 If you're looking to stay in Brussels in a friendly, international atmosphere, the Jacques Brel Youth Hostel is perfect for you! Located in the Uptown of the city (10 minutes walking from the Grand’ Place), it is ideal for all type of travelers. We offer quality twin, triple, 4 and 6 bedded rooms all with ensuite showers and washbasins. Please, contact us if you need a complete ensuite room. The Youth Hostel team organize concerts and a range of activities in partnership with local associations … Discover with us the real soul of the European Capital! WHAT CAN YOU FIND NEARBY THE HOSTEL? -Reception open from 8:00 am to 8: 00 pm / Bar-Reception open from 6:00 pm to 1:00 am. -Room check in is available from 3:00 pm. -Bar serving everyday fresh Belgian Craft Beer. Really great location. My friend and I enjoyed our stay here and it was totally worth it. The beds are comfy and the bathrooms are clean and well kept. The staff if really friendly and easy to work with. When we checked out, they let us leave our bags there so we can hang out some more. I would definitely recommend this place. Staff were absolutely amazing! Overall nice hostel. Excellent little hostel! Very safe and secure with keycard operated locks at the entrance and the rooms. There are lockers in the rooms and a luggage room with plenty of lockable storage. The free breakfast was expansive, and the evening bar is very well stocked and priced, with a friendly bartender. Atmosphere is great, with young travelers being the primary demographic of guests. Everything was okay except the PEOPLE visiting the hostel - seemed to only attract medium sized closed off groups and families. Not the hostel vibe I was after. Otherwise the facilities and location were reasonable. Pros: Friendly Staff and secure hostel. Nice atmosphere and filling breakfast. Guest kitchen available. Cons: Towels not included. And you have to prepare your beds on your own. It was okay. Staff is friendly, but the atmosphere was not that good. Lots that kept to themselves. Very to get a “Bon Jour” from someone. I stayed here for one night. The hostel got the job done, as it was clean and had friendly staff. However, don't expect the backpacker vibe that many other hostels have. They had a bar downstairs, but there was still minimal interaction between guests. The atmosphere was more like that of a hotel than a hostel. There were even families with little kids staying here. Unfortunately this seems typical of hostels in Brussels, and while it definitely got the job done, it wasn't a very fun hostel. Breafast included was good. Good that they had soya and vegan butter - rare! The location was decent - centre and most major attractions were walkable. Staff were helpful. Kitchen facilities were weak - seemingly no sharp knives or chopping boards. Would be difficult to imagine more than one person cooking in there. Also we had to make our own bed. A minor point but given that this hostel is not particularly cheap it was a little cheeky. Very disappointed with the lack of simple necessities ie soap and bath mat. Although the hostel is fairly close to La Grand Place, walking at night to and from the hostel (as two females) did not feel safe. Some staff helpful but others not friendly or accommodating at all. Pictures on the website are definitely quite decieving.